Standard Gypsum Board is mainly made from building gypsum with appropriate amount lightweight material,fiber reinforced material and additives, and is sticked to the paper. It has fire resistance and sound insulation function. Moisture Resistant Gypsum Board is mainly made from building gypsum with appropriate amount fiber reinforced material and water--proof additives, and is sticked to the paper.It is used in moist and semi--exposed place,whose surface can be sticked with the tile. 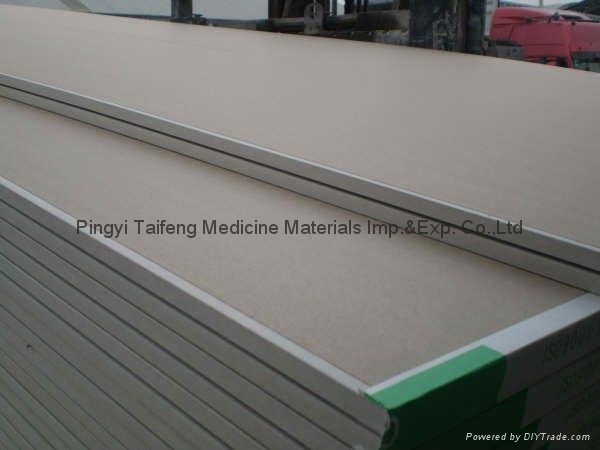 Fire Resistant Gypsum Board is mainly made from building gypsum with appropriate amount lightweight material,inorganic fireproof fiber material and additives, and is sticked to the paper. It is the building material which improves the binding force of the core.It has strong fire resistance when it is used as partition and ceiling.